To select the ping pong table that tops our list, we looked for a product that combines high quality and an affordable price. The Stiga Advantage Ping Pong Table checks those boxes and many, many more. The Advantage measures 60" x 108" x 30" and is relatively lightweight. It's a professional-sized table with professional quality. But for about $450, the price tag is affordable for anyone looking to invest in a fun, new sport to play. At 5/8 inches thick, the tabletop is smooth, durable and offers consistent bounce and spin every time. The Advantage is sturdy too, guaranteed not to wobble or roll away. It’s equipped with steel legs coated in a matte black finish and 3-inch lockable wheels. Rubber leg levelers protect the floor from scratches and allow you to adjust the table height for an even playing surface. And once you hit game point, this table easily folds in half for compact storage. For many customers, ping pong is simply meant to be, you know, fun. And what fun is it to break the bank on a game? You causal ping pongers will want to check out EastPoint Sports. They price their EPS 3000 ping pong table at just over $200—a number that will leave you smiling with every backhand, rally, and game point. There are certainly cheaper ping pong tables on the market—many even drop below the $100 mark—but the EPS 3000, a well-crafted, tournament-sized table, is our budget pick for the quality it brings, along with its great price. This table has a sturdy, rust-resistant steel frame and 2-inch lockable wheels, making it durable enough for years of excellent play. And like higher-end ping pong tables, the EPS 3000 can be adjusted to a playback position and folded in half for storage. A few customers did note that this table was difficult to put together or arrived with broken parts, but most customers have been happy with their purchase. It's a good quality table for the price, and the convenient side-storage system is a huge plus. The JOOLA Rally TL Professional Grade was runner-up for our best overall ping pong table, showcasing a quality to cost ratio comparable to the Stiga Advantage. The Rally fell just short due to a slightly higher price tag and other minor differences, but it remains a spectacular ping pong table nonetheless, especially suited for indoor play. The Rally boasts a 5/8-inch thick tabletop, thick steel legs with adjustable height and lockable wheels for stability as well as easy maneuvering. Whether you’re playing on wood, carpet or tile, this table won’t be a problem for the floor, as it’s equipped with protective rubber leg levelers. The Rally can be folded in half for quick, compact storage or adjusted to a playback position (where one side of the table is put at a 90-degree angle) for a ping ponger who wants to play solo. This product also comes with a couple nifty and convenient features, like ping pong ball holders on each corner and two magnetic abacuses for keeping score. Looking for another tabletop game to play? Check out our list of the best air hockey tables. JOOLA makes another appearance on our list, this time with their Nova DX table. One of its biggest draws is its versatility, as it can be used both indoors and outdoors with the same top-grade play. For those looking to use this table outside, you’ll be happy to know that it’s strong enough to battle the elements. The 6-millimeter aluminum plastic composite surface is waterproof, rust-resistant and able to withstand chipping and warping. The net is also waterproof, ensuring no soggy play year-round. And customers say the assembly process is quick and simple. For other outdoor games that you can play with friends, check out our list of the best lawn games available for purchase. They’re back again. One of the most beloved brands in ping pong even makes a table perfect for small spaces. Measuring 72” x 36” x 30”, the JOOLA Midsize is roughly 2/3 the size of a regulation table, allowing it to fit nicely in apartments, garages, and basements. Storage for this little guy is, as to be expected, effortless. Just fold the steel legs in, separate the table halves and tuck the Midsize into a closet or underneath a bed. When broken down like this, its storage dimensions are a compact 3 feet by 3 feet. And as a unique add-on, this table can be converted for multiple uses: each table half makes an excellent space to play card games or board games and, available in two color options, you can select the style that best suits your décor. The Classic colorway offers a timeless blue and white striped table, while Sport comes in an eye-catching black matte finish with thick white stripes. So, what does a professional-grade ping pong table come with? Cornilleau’s 500M Crossover table offers state-of-the-art features, unparalleled quality, and international recognition. Its 7-millimeter resin laminate top offers the firmest, bounciest playing surface out there, and a patented MATTOP anti-glare finish provides excellent ball adherence, giving your shots maximum control and spin. To make sure the playing surface is sturdy and level, Cornilleau uses a thick, galvanized steel frame for support. And as an added bonus, this table is waterproof, allowing you to play like an expert outside as well as inside. Another pro tip? Invest in a quality ping pong paddle that's made of lightweight, high-performance materials for extra power and spin. Conversion tops provide great flexibility as they let you turn any sizable table into a spot to break out your paddles. With JOOLA’s 4-Piece Tetra Table Tennis Conversion Top, you can simply unfold the two separate table halves and place them atop billiard tables, dining tables, picnic tables and more. Assembly takes just seconds. When it's set up, the table measures 9 feet by 5 feet. Each half weighs 42.5 pounds, making the Tetra light enough to pick up and assemble but heavy enough to provide the caliber of a regular-sized ping pong table. And to make sure the table you’re playing on doesn’t get damaged, JOOLA hooked this product up with scratch-free protective padding underneath. Conversion tops are the best of both worlds, and the Tetra is the best of the best. Putting a few hundred bucks into a ping pong table means you’ll want to protect your investment, and the best way to do that is with a dependable table cover. 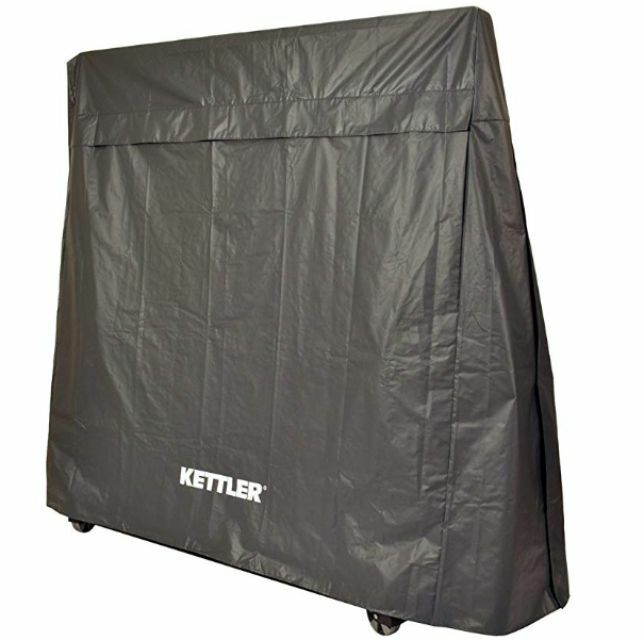 This Kettler cover is great for both indoor and outdoor tables. It’s thick enough to guard against bumps and scratches and specially engineered to withstand rain, snow, dirt, sun, mold, and mildew. Built-in air vents allow heat and moisture to ventilate, and the reinforced corners provide extra protection. The product is also guaranteed under Kettler’s two-year warranty. Above all else, customers love this table cover’s ease of use. Simply fold your ping pong table into the storage position, slide the Kettler cover overtop, and securely shut it with the product’s Velcro siding.